← Giving: Does It Always Have To Be About The Money? Most of us don’t often get the chance to meet face to face with the top echelon of corporate management if we work in a mid or large cap company. Speaking with or presenting your case to senior corporate executives, such as group vice presidents, Presidents, CEOs or CFOs can be very intimidating if you aren’t used to doing so. Although I worked as a project manager and mid-level staff manager in several companies, I only had the opportunity a handful of times. It was a unique and interesting experience. This type of experience can further your career chances or lead to it’s destruction! 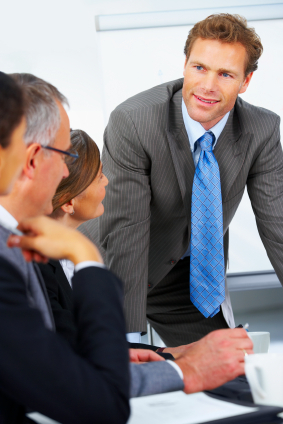 C-Level Executives Are Different Than The Rest Of Us. Sure, they are human, CEOs, CFOs, CIOs and other C levels have families, attend sporting or cultural events and the like, but they are focused on much bigger things and have the power to make them happen or crush them in the womb. They are paid to run the company – to make the decisions and set the strategic direction the rest of us will follow. They are charged with making sure the company is profitable by doing things such as improving customer satisfaction, increasing market share, decreasing operating expenses, increasing revenues, shortening the time to market for products, improving employee performance and beating the competition. These are all things that affect the ‘bottom-line’ of the company finances. They have limited time to spend on your project or concern. They are usually intelligent, quick to note issues or omissions and don’t hesitate to speak their minds and drill for answers. Their careers are on the line for the decisions they make and they have limited time to understand and see if your project will positively affect the bottom-line items. If you have an initiative that needs authorization from a senior executive, it helps to keep their perspective in mind. Here are a few other tips I’ve learned by experience or through others. If you are called on to present or discuss a project with an exec, make sure that you can cover any and all aspects of the facts available. Although your time with the exec may be short, and you will start with the bottom-line benefit to the company, your exec will most likely blast you with questions to dig out any potential issues, omissions or uncertainties on your part. Practice your approach with an audience. If you can get someone that reports to the exec (like a director or vice president) to review your planned approach, follow any suggestions they give! See if they will let you practice it with them. If all else fails, try to enlist the aide of their executive assistant. At one point in my career, the group vice-president of our division put out an all points request to all of us managers reporting up to him. The request was to identify projects that we could do to improve efficiency in the organization. Unlike most of my peers, I had some to offer. Instead of going straight to him with the projects, I took them to the vice-president through whom I reported. I got all kinds of help from that vice-president – from drafting the email listing the project proposals to sitting down with me to meet with the higher up. Following that meeting, when the group vice-president approved the project, I got help from him in preparing to take them even further up the ladder. Tell Them Why They Are Meeting With You. Sure, you have long anticipated and nervously awaited this appointment – but for them it is one in a dreary multitude of meetings and decisions. They may not actually remember what this particular meeting is about! Start with how your initiative helps the bottom-line and keep coming back to that throughout your time. Tell, show and demonstrate which bottom-line item it affects, why it will affect it, how it will affect it, when and where it will positively affect company profits, retention, expense reduction, employee performance or other specific bottom-line item. As the Project Manager of what we thought was one of the countries largest IT mainframe projects, I was involved in meetings with vice-presidents, several group vice-presidents, and the company president (who later became the CEO). I, along with the executive sponsor, staff manager, and project leaders were proposing a legacy computer system rewrite. The bottom-line was hard to find, let alone state. Basically, the team, and most especially the project’s executive sponsor, felt that without the project, our core product would fail within a few years. It is pretty hard to prove that a set of computer systems, cobbled together over 20 odd years will fail due to specific and certain things. The executive sponsor chose to present to the execs prior to getting the bottom-line justification in place. We spent weeks preparing and practicing under her guidance. Guess what? After the presentation to the top execs, the team was instructed to go back and find out what the bottom-line impact would be if the project weren’t done! Sometimes senior executives have special pet initiatives with which they become personally involved. This happened to be the case during the 2000’s for me. Computer security issues were causing companies lots of headaches at the time and an executive I reported up to had a laser like focus on anything related to security. When I showed an interest in the topic, he designated me the lead on a company wide project to enhance security measures and then worked weekly with me to ensure the project was successful – using his influence with his peers to ensure compliance company wide with the measures being enacted. Sometimes execs have pet peeves that trigger negative reactions as well. Try to understand and avoid those! Keep It Shorter Than The Time Allowed. If you are hoping for a positive decision for your initiative, make sure that YOU don’t take up all the time explaining it. You need to allow time for questions and discussions and for the executive to determine what next steps they think they want to see. If you use visual aides, keep them few in number, but be prepared to pull out details if needed. If you do get the go ahead for your initiative, don’t expect a lot of instruction or continued interaction. It’s their job to set direction, it’s yours to make it happen once set! Come to your initial meeting with a plan for implementing your initiative, but be prepared to change it up based on senior level discussion. Make sure you have a concrete way to measure results to the bottom line once your initiative has been completed. Remember that your executive puts his or her career on the line with individual decisions and strategic direction setting. You will be called on to show the results, bank on it. Sometimes senior executives become somewhat egotistical – with all the power they wield and the deference they are shown. If your executive behaves badly, blames you for something unavoidable or not your responsibility or otherwise makes you feel badly, remember that it usually isn’t personal. Leave your ego at the door, but keep your self-confidence intact. What is your experience using “C-Speak”? What tips can you offer our readers on how to talk to senior level executives? From my experience, I’d say it’s important to focus on what’s important, get to the point, and remember that they have limited time. It’s also necessary to be prepared – very prepared in some cases. Be ready for the tough questions you hope they don’t ask, because in reality some senior executives can have an uncanny ability to figure out these tough questions to ask very quickly! So true. They have seen and heard a lot of propositions and have experience getting to the gist of the matter. Good thoughts, although I will disagree that they are that different. I was one of those guys (CFO) and enjoyed talking to everyone. Anytime you present something to anyone, you should be prepared. I learned that early in my career and never forgot it. My daughter works for a multi-billion dollar company and early in her career she represented her department in a senior (weekly) meeting, she had to be o her toes all the time. She learns a lot from these meetings. I call it preparation for that next promotion (VP). Think of your years working as accumulating the experience to do that next great thing. Seems a sensible set of guidelines to me but, as I used to advise younger colleagues before an important event, they all sit on the toilet just like everyone else. And it may be that the company/institution or whatever is not ready for innovative ideas or people, treat every such occasion as an exercise for the next one. Eventually someone will say yes! Yes the C level execs are human but as I replied to Krantcents, sometimes different..
– Be prepared. Even if you are presenting something as initial and high level, think through all of the downstream implementation aspects. – Prep for Q&A. Think of all of the pitfalls with what you are proposing, and be prepared with answers to address all of these things. – Project confidence, even if you don’t have any. Sounding confident and reassuring can go a long way to mitigating executive concerns. Part of this confidence should come from being on top of your material and knowing it well. You are right on with the confidence tip. Execs zero in quickly on hesitation. I hate it when that happens! The kicker is that the person who picked it up actually thinks it is their idea!